The oaks have burst into fresh green leaf – it seems almost overnight. This year they definitely seem to be ahead of the ash, in the south-east of the country, at least. 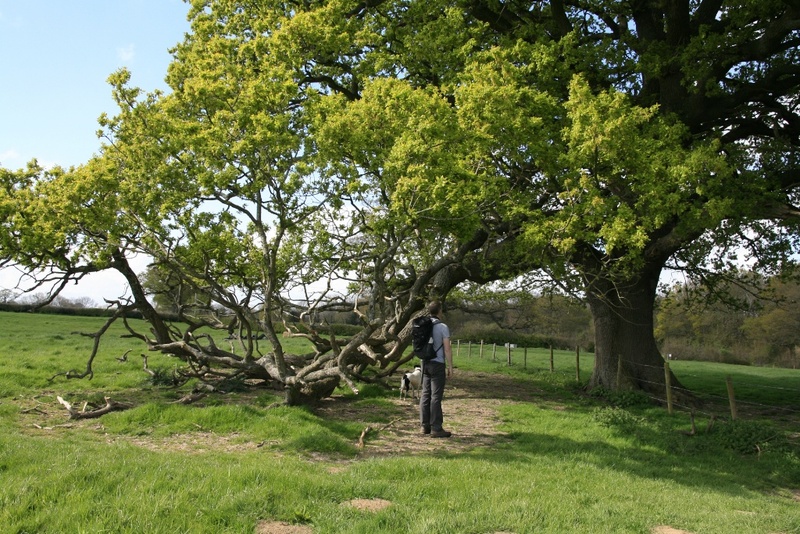 We went for a walk in East Sussex today, and found this lovely old hedgerow oak which had dropped two major branches so that they rested on the ground. The branches hadn't entirely sheared through, and both were still vigorous with life. Oaks have many survival strategies, including dropping branches, allowing the heartwood to rot, and letting the top section die (become 'stag-headed') in order to conserve energy. They can carry on for several hundred years after sustaining what we see as 'damage' but what is, to them, a valid strategy for life. And even after they die they continue to sustain life: birds like the little owl love to roost in their decaying trunks, and as they finally fall and rot down they give life to countless invertebrates including stag beetle larva, on their six-year journey to adulthood: a long life cycle for a bug, but the blink of an eye to an oak.